The unusual combination of parsnips in these scones give the treats a sweet, nutty flavor. Omit the glaze and you have a great substitute for dinner rolls. Serve the bite-sized versions as holiday hors d’oeuvres. Danielle demoed these for a class at Brookside Gardens in Wheaton November 13, 2013. Peel and cube the parsnips. Put in a pot, cover with water and bring to a boil, reduce heat and simmer until soft, about 10 minutes. Drain and mash with 2 tablespoons coconut milk. Let mash cool in fridge while you prepare the dough. Mix together the dry ingredients; add butter, which should be cut into 8 pieces and work it into the dry ingredients until the mixture resembles wet sand. Add the pecan pieces, egg, Agave nectar, 1 cup mashed parsnip (rest is for glaze) and mix well. If the batter is dry, begin adding the ¼ cup coconut milk, 1 tablespoon at a time. (Often the parsnips are moist enough there is no need for additional liquid). Form into a ball, flatten it gently and chill for a couple of hours or overnight. 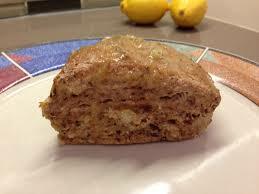 Remove from fridge, roll gently until the dough is about 1½ inches thick and cut with 2-inch cookie cutter. You can also keep the dough round and cut it into 8 wedges like a pie. Transfer the scones on to an oiled baking sheet, brush with egg white and bake at 350º for 20-25 minutes. While the scones are baking, prepare the glaze. Glaze: in a small blender (or use a mortar and pestle), grind fennel seeds into a powder. In a small bowl, mix the remaining mashed parsnips, juice of 1 lemon, fennel and 1 tablespoon of coconut milk. Add sugar a tablespoon at a time. Blend well. Once the scones are baked, transfer them on to a rack to cool slightly. Drizzle glaze on warm scones or transfer to a pastry bag and pipe on. Makes 8 large scones or 12 smaller, round ones. This entry was posted in Appetizers, Brunch, Muffins, breads, crackers, Recipes, Recipes from Danielle's pantry, Vegetarian and tagged parsnips. Bookmark the permalink.